Without Form and Void - Will the Earth be Returned to That State? "Without Form and Void" is how Genesis 1 describes the earth before creation week. As the Bible describes it, by the time of the Second Coming, the earth will be returned to that state and will remain like that until a new heavens and a new earth are created after the millennium. Yet, many groups (evangelical and messianic) believe that the saved will spend the millennium on earth. Here are some quotes typical of those who believe that people will survive into the millennium and be involved with the saints that had previously gone to heaven (in the rapture) in restoring the earth. "The cities of the world will all be destroyed, just as when the Katrina and Rita hurricanes devastated the cities and left them as if no one had ever lived there: ... There will be a lot of work to do; we will rebuild the cities as the mortals will start to multiply." "In order for the Lord and us to establish a nice, beautiful, good, clean heaven on earth, we'll first have to clean up the hell on earth that the Antichrist and his demon-possessed people left behind!... So there will certainly be some cleaning up to do!" "We believe that Christ and His followers will spend the millennium transforming our nearly-destroyed earth into a paradise for those people who survive the Day of the Lord." So much for floating around on clouds playing a harp! These people believe the saints previously raptured to heaven will reign over the earth and will be involved with those left behind, after the rapture, in its restoration. The purpose of this study is to examine the events preceding the Second Coming to see if this theory is Biblical. To understand what the earth is going to be like at the end of the world, we will start by looking at what it was like at the beginning of the world. It seems to indicate that the earth was covered with water before the Spirit of God began to move upon it and change it from without form and void into a paradise for the use of man. Then what happened in creation week? Day 1 - the light and the light dark cycle (there already was darkness - the absence of light) was established. Light is needed for life. This passage establishes the principle that evening and morning are a 24-hour period. (There is a principle that the first use in scripture of a word, phrase or concept has a great bearing on its meaning in later uses.) An evening and a morning is a day, not a year. This becomes of interest when we get to the prophecies of Daniel and start talking about the day-year principle. Day 2 - the firmament that divided the waters was created. This is the atmosphere separating the waters below (the surface waters of the earth) from the canopy of water above. The water above formed a canopy giving the earth a greenhouse-like environment and even temperatures. These waters came down during Noah's flood. Day 3 - the dry land was separated from the water and filled with plants. The dry land was needed for non-aquatic life. God was preparing each area of the earth and then filling it with life, beginning to change it from its original without form and void condition. Day 4 - the sun and the moon and their cycle was established. Day 5 - fish and birds were created to live in the prepared surface waters and the firmament (sky) of the earth. Day 6 - land animals and man were created to live on the dry land portion of the earth. And so, within six working days, the earth goes from being without form and void and in darkness to a state of order and beauty and is declared to be "very good." That's a pretty productive work week! Day 0 indicates the state of the earth before God worked to do something with it. God's intent was that man should now enjoy the wonders of creation that God had provided for him as was His original plan. Unfortunately, due to choices our first parents made, that plan has been thwarted for a time. Jeremiah is describing the earth and using some of the same words - "without form and void" - that were used to describe what it was like before creation week. Is he also describing the earth before creation when clearly it was "without form and void"? The context would seem to indicate not. If not, at what time is he viewing the earth? What has happened to the earth that he could be describing it like that? 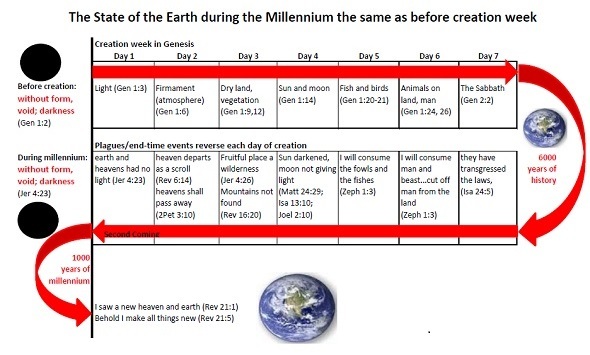 We want to compare Jeremiah's description of the earth at the Second Coming to its state before creation and determine what happens to essentially return the earth to a pre-creation state ("without form and void"); to, in a sense, reverse creation. Just before the Second Coming there will be a series of events described in Revelation 16 and referred to as the seven last plagues. And there are other passages of scripture that also relate events happening at or shortly before the Second Coming. We want to look for anything that gives clues as to the physical state of the earth. We are looking for evidence to confirm what Jeremiah says he saw. This verse is not saying that God does not smite the earth with a curse but rather that he will turn the heart of fathers and children to each other in an attempt to avoid the earth being cursed. God never forces the heart or the mind or the will but He will make efforts to do that by pouring out His spiritual presence. He offers a choice. Obtaining a blessing and avoiding a curse is always conditional on obedience. And having a heart turned toward someone else does not necessarily mean acceptance of the other person. For God to present the alternatives described in the verse below and urge people to choose life is surely an example of pouring out His Spirit and yet they choice is left up to man; God does not force the will. This could be a reference to the change in the Sabbath commandment along with all the other broken laws. God designated the Sabbath to be a memorial, a reminder of creation. God judged nations in the past for transgression. In the last days, man will, as a united world, pass laws to do away with God's Sabbath day. This is related to the mark of the beast - watch for a future study. Remember, he has said "I beheld the earth" It doesn't sound to me like Jeremiah is looking just at Jerusalem or some small corner of the earth. It's not that he doesn't see any man in his field of view while there are people everywhere else. He is being given an overview of the condition of the earth and he sees no man. Why no one to bury them? Could it be because there is no one left alive? I would think that a very high priority if there were people left alive would be do dispose of the corpses. As John looks at the waters that have turned to blood why would he say "as the blood of a dead man?" Not because it is bright red - only freshly-oxygenated blood is red. Not because it is red but because it is anoxic. It can't carry oxygen any more. It can't support life. That's why he says "every living soul died in the sea." The days are being examined in order here but not everything necessarily happens in that order. There may be some overlap and plenty of dead bodies before the last of the birds are also killed. Every other reference to "eagles" in scripture is in a non-literal, symbolic sense. For example, as a simile: "... his hairs were grown like eagles' feathers" (Dan 4:33) or as a metaphor: "swifter than eagles," (Jer 4:13); "I bare you on eagle's wings." (Exo 19:4). The birds and fish are no longer. The fifth day of creation is reversed. It doesn't say how long the sun will be darkened or if it will stay darkened, however, we'll see later a statement about "no light." The work done of the fourth day of creation is reversed. If men are scorched with great heat what would happen to the plants? The fruitful place is a place that produces fruit or produce or food. It has become a wilderness; non-productive. The earth is no longer fruitful; it cannot produce the food needed to sustain life. The landscape itself is greatly changed. The third day of creation is reversed. The watery canopy above the earth was already removed at the time of the flood. Now, the heavens roll back as a scroll (whatever that means). The second day of creation is reversed. It seems that by the Second Coming, even the provision of light created on the first day of creation is affected. And so, we see, that creation has been reversed, the earth has been returned to its original state of "without form and void." For a larger image, download in PDF format (195kb) here. How many people are going to be able to live on earth when it is again "without form and void" during the millennium? There are no fish, no birds, no land beasts, no vegetation. The land is a wilderness with no cities. What will they eat? What will they drink? - blood? There is no light. How will they find their way around in the darkness? Do you really want the job of fixing this!!!??? It will not be possible to live on this earth by the time the millennium starts. The new heavens and new earth are not created until after the millennium.